Real Madrid faced Barcelona twice in the span of 3 days and were defeated both the times in their own stadium. Ivan Rakitic's goal was all it took FC Barcelona to clinch the victory as they sealed a comfortable 1-0 win. FC Barcelona, in the process, created some staggering records. If we just take La Liga into consideration Real Madrid C.F have failed to register a single win in their last four home games against FC Barcelona as the Catalans became the first team to win four consecutive games at the Bernabeu in La Liga history. FC Barcelona's victory against Real Madrid last night also means that the club have now taken the lead when it comes to all-time Clasico victories. The Catalonia based club has now overtaken Real Madrid with 96 wins in the El Clasico whereas the Los Blancos have managed to register 95 victories. The two sides have played out 51 draws between themselves. FC Barcelona's lead in all-time Clasico charts came in after a long wait of 88 years. Real Madrid haven't won a single league game against Barca at the Bernabeu since 2014 and their last victory in the league against Barca came way back in 2016 at the Camp Nou. Real Madrid have also failed to score in any of the last three Clasico's at the Santiago Bernabeu. In comparison, Barcelona have managed to score 7 goals at the Bernabeu, which proves that they love playing there. 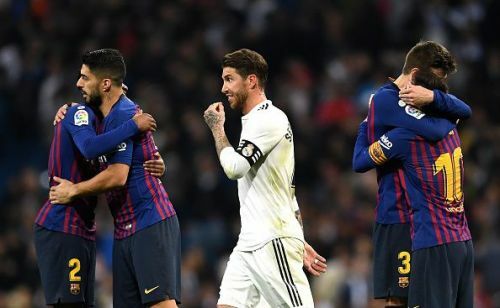 On the other hand, after last night's loss, Real Madrid captain Sergio Ramos set another unwanted record to his name as he became the player with most defeats in the El Clasico with the tally now standing at 20 games. The El Clasico victory ensured that Real Madrid's title hopes are over as they now trail FC Barcelona by 12 points with just 12 games left for the league to be wrapped up. With this victory, Barca should easily go on to win the league now.